Time for another Read Aloud Thursday over at Hope is in the Word. This week we're focusing on books we've read aloud by Janet Halfmann. At our stage of life, animals make the most intriguing subject matters in books so I was happy to have some new titles to browse through. First we started off with Halfmann's latest work, Little Skink's Tail (published by Sylvan Dell). Halfmann wrote this particular picture book after doing some research for an article she was writing on skinks for Ranger Rick magazine. In this story Little Skink loses her tale when escaping from a rather eager and hungry crow. Little Skink's Tail is sad by the loss of her tail and throughout the remainder of the book she is imagining what she would look like with the tails of other animals, such as a deer, a rabbit, an owl, etc. Halfmann explains that when she wrote this story she was thinking of her granddaughter who likes to play dress-up and imagined her wanting to try on different outfits. Coupled with excellent illustrations by Laurie Allen Klein, this is a very cute book and my son enjoyed identifying and pointing out the different animals. In the back of this book you'll find various animal tracks which you can identify with your children set up with a "matching game" sort of feel to it. Very cute and fun edition to this book. We like it. Little Skink's Tail is apparently also gaining in notoriety. It has received the following attention: Mom's Choice Awards: Best Children's Book of 2009 (1 of 3), plus Gold Recipient: Educators' Choice & Animal Kingdom; 2009 Teachers' Choice Award: Learning Magazine; 2008 Best Overall Book and Best Picture Book: Florida Publishers Association. Not too shabby, I'd say. Soundprints has published some of Halfmann's other works as part of their Smithsonian Institution series. 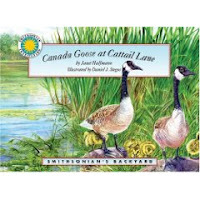 We read Canada Goose at Cattail Lane (Smithsonian Backyard) (Smithsonian Backyard) , which is the story of a pair of of geese who lay and guard their eggs. The eggs eventually hatch, of course, and we are given the opportunity through this story to watch the little goslings grow up. 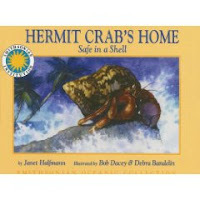 In her book Hermit Crab's Home we are also introduced to baby land hermit crab from egg stage to adult. These Smithsonian Institution books are interesting and unique in that they give a lot more detail (scientific) about the individual animal's life than you usually see in picture books. Although they do tell a story that children can easily follow along with, they are written to educate the young reader as to the life cycles of various animals. Thinking Ranger Rick on these books would give you a pretty good idea of what they are like. You can learn more about the author by reading this article first published by California Kids in 2008. We like her stuff and are happy to recommend her works as being able to satisfy little minds and imaginations as they explore the animal world around them! Her books are a good fit for us right now. These sound great, Carrie. I'll have to look around for Little Skink's Tail since dh and I have an old inside joke about skinks. ; ) I've seen those Smithsonian books, too. They're really thorough. These sound like great books! I think my daughter would really enjoy Little Skink's Tail. Carrie, thank you so much for your wonderful author highlight about me and my books. I can't help but wonder what the inside joke about skinks is—perhaps Amy will share. I have my own skink story—or I should say the illustrator's story. She lives in Florida where skinks are more common than in Wisconsin where I live. And right after she got the assignment, she found a skink with a blue tail in her garage!! She thought it was fate that she draw the pictures for the story!